When was the last time you checked your Dog’s ID tag? For clarity, readability, if it was still attached to the collar?? I had the unfortunate, or in this case fortunate, experience of this happening to me late one night. I was driving home from a pet sit at 10:15pm in the rain, on a normally busy street in The Catalina Foothills area of Tucson, AZ. I have a habit of sweeping my eyes across to the sides of the road because I have had coyotes and javelinas run into my path. So I am on my guard given it is dark, wet and with no street lights around. So I was surprised when I could barely make out 2 wiggly creatures on the right side of the road coming towards me. One had a high, fast moving tail which looked like it belonged to a dog. And it had a companion with it. I quickly turned around entering a side street. I got out, opened my back door and called to the animals, hoping they would hear and listen to my words. One came running and jumped right in. She was shaking like a leaf and too adorable for words. A lovely red cocker spaniel. I closed the door while I tried to entice the other to come to me. All the while trying to make sure the oncoming traffic wouldn’t hit the poor thing. Luckily the cars slowed to avoid the dog. The dog, a King Charles Terrier, finally came to me and jumped inside my door. I got in and quickly checked their collars. Good thing the dogs were so cute and friendly. That made it easier to remove their collars and check for ID. Both had collars, but only one had an ID tag. Ugggh!!!! The ID that only one of the dogs had on her was faded. With reading glasses in hand I tried to read the phone number. No chance – the number was faded and I couldn’t read the lasts 2 digits. The back of the ID had a Last name and address, and another phone number. While it was somewhat readable, it was so small I could not make out the words. I called my husband and told him what had happened and that I was heading home (less than a mile away) to get his help in reading the ID tags. I had first waited a bit at the location where I found the dogs in case I saw anyone walking around with flashlights or driving slowly looking for their pups. But no luck. And there are a few side streets in the area so I didn’t even know from which direction they would have come. I arrived home, keeping the dogs in the closed garage so as not to interact with my 2 large and senior dogs. I think they all would have got along famously but I didn’t need to find out otherwise. After a while my husband was able to identify the location noted on the tag. Again both phone numbers were not readable. So we hopped back in my car and headed to their home using our GPS as navigator. As we got closer to their home there was a car parked in the middle of the road with their brights/high beams on. As I approached it a woman called out asking if we had seen 2 dogs. And I yelled back happily “I’ve got them! 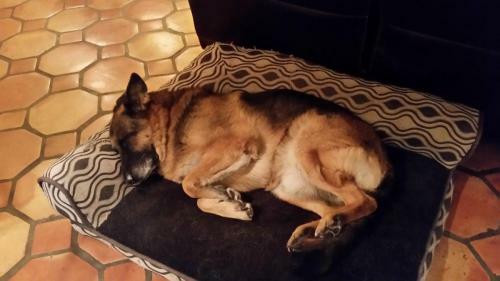 !” She was so thrilled and followed me in the direction of her home. When we arrived I asked that they get leashes for the dogs as I was afraid once they had experienced freedom, they may bolt again. A few other relatives of the pets were also outside and everyone was happy, thankful and relieved. 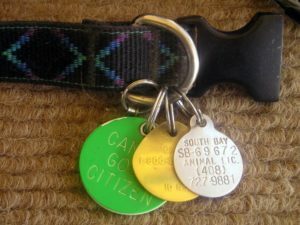 I said there was lesson for all of us – to make sure the ID tags are on the dogs and readable. I didn’t want to “lecture” them about it at the moment because I think they were so relieved the outcome wasn’t worse and acknowledged that one of the dogs didn’t even have a tag on her collar. So why the need to share my story? Because many pet owners, including myself, don’t regularly check their dog’s tags to ensure they are still attached and readable. When I returned home I checked my own dogs’ tags. Phone numbers were visible on both, but I could not clearly read my German Shephard, Harley’s, name. It is important to know the dog’s name in order to make them feel comfortable in your care. I kept calling one of the dogs rescued Lucy until my husband said her name was Lily. I could not plainly see it, and with glasses it still wasn’t clear. I even took a photo of it so as to enlarge the number. Now I see it was Lily and not Lucy but in the moment it wasn’t obvious. 1. Above all make sure your pet is microchipped. Because if the dogs had not had collars nor ID tags I would have brought them to my vet the next day to be scanned for a microchip. And what would have happened if they had not been chipped…. I would probably be the (temporary) proud owner of 4 dogs instead of 2. 2. 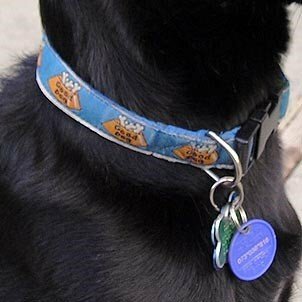 Make sure your pet wears a collar with ID tag on it at all times. Some of my clients have their dog’s name and their cell phone number boldly engraved on their dog’s collar. 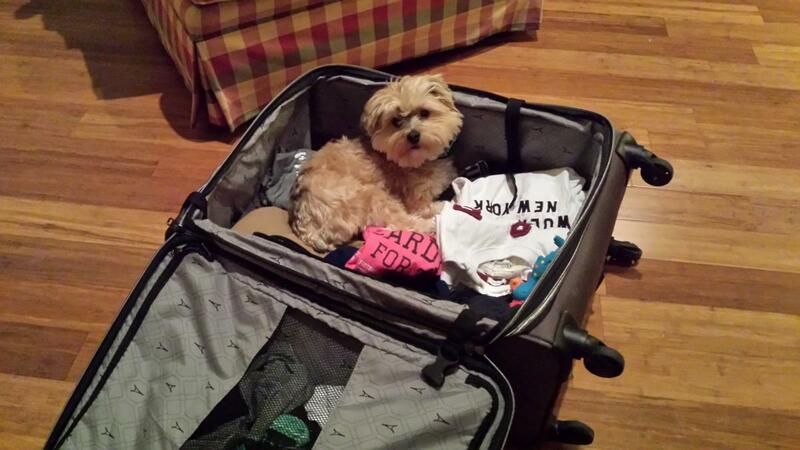 A very smart move as not all pets want a stranger wrangling their collar to view an ID tag. This way the name and phone number are visible with a glance at the pet. a. Name of pet – there is actually some differing viewpoints about this item. I personally have my pets’ name on their ID tags. I want whomever finds them to call them by name so they will be more comfortable in their care. Others prefer to keep the pet’s name private. Some believe that listing the name of the dog can help thieves. Or allows the person who found the dog extra familiarity. Sadly some people keep dogs they find thinking they were “abandoned”. So in lieu of putting the dog’s name, some owners might include only the family surname. b. An Up to date phone number – Your Cell number and any other cell numbers which should be called in case the pet gets loose. Also a landline phone number (if applicable) in case you are not accessible via cell at all hours. c. Your address – including house number and name of street. And remember to update this information should you move. 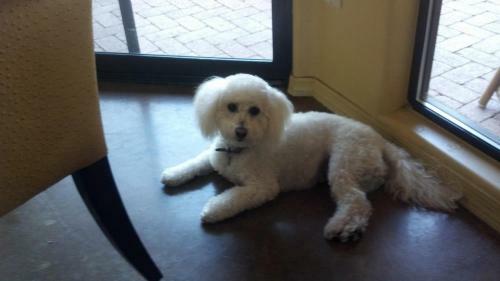 Oftentimes when a dog gets loose, she could still be wandering around the neighborhood. Like with my situation. If the address hadn’t been on the ID tag, we would not have been able to return the 2 dogs back home as quickly. e. Ensure all the information is in LARGE PRINT. And in a clear, block-style font for easy viewing. No need for fancy with the lettering. 4. It’s a good idea to also have your pet wear her proof of rabies vaccination to let whoever finds her know that she’s up-to-date on her shots. Finally a reminder to check your pet’s ID tags every couple of months for legibility. Most ID tags are not engraved very deeply, and the information tends to wear off. Make sure they are still easily readable and replace them if they’ve become worn or scratched. And here’s hoping your ending will be as happy as the one I had!